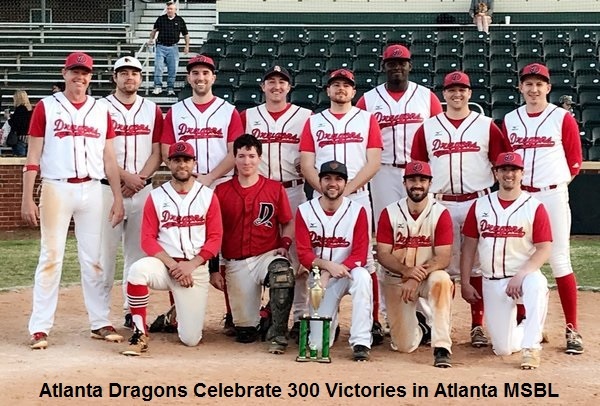 The Dragons reached an impressive franchise milestone with their 300th team victory coming over the rival Cherokees. There is a lineage of proud former Dragons that will be happy to hear they paved the way to for a team that always represents the MSBL in positive fashion. On Sunday at Shamrock, the Dragons did what they often times have over their 22 yr history. There were a lot of contributors, led by a pitching staff who has collectively put together a 1.09 ERA, 1.06 WHIP, and held opponents to a .197 batting average. Today, it was Stef Lollar (4-0, 1 save, 0.64 ERA) going 5 innings for the win, allowing 4 hits, and striking out 5. Chris Haggard (4-1, 1 save, 2.18 ERA) picked up the 3 inning save going 3 scoreless allowing just 3 hits. The offense was paced by Brendan Pilger who after a slow start is up to a .442 batting average and .556 OBP. PIlger was 3 for 4 with a walk, 2 runs, 2 RBI and added a SB. Joe Rodriguez (.391) was 2 for 4 with 2 runs, always putting together solid AB’s and stretching the lineup hitting out of the 4 hole. James Cooper continued his recent good work going 2 for 3 with 3 runs, 2 RBI, and 2 BB’s and has his average up to .326 after starting off slow. Justin Myles put together 5 solid AB’s and went 1 for 3 with 2 bb’s, a run, and 2 RBI. Myles OBP is up to .404 and his work behind the plate is as good as anyone in the league. Brett Washburn (.397) was 2 for 3, 1 run, 3 RBI, and a walk to get back on track and put the Dragons on the board in the 2nd with a 2 run single. The Dragons offense has put together a .339 BA but more remarkable is the .456 OBP. Patient at bats and stretching these opposing starting pitchers has made life difficult for the opposition. We’ve been able to do much of that because of the teams strong consistent strong pitching and depth. 7 Dragons pitchers have posted an ERA under 2.57 with 5 of them under a 1.00 – those are video game numbers! 40 walks given up vs 140 strikouts as a team. 5 guys have thrown 10 innings or more and no one has more than 33 IP after 18 games. Proud to continue an amazing 3 year run that has accumulated a 58-10-2 record over our last 70 games. Pretty remarkable. A very tough, feisty, Tainos (11-2) team is next with the #1 seed at stake. 4pm at Ward Field next Sunday. We will have to be ready to play.